Parents seeking baptism for their child at Ss. Peter and Paul Church should be registered members o the parish. The Sacrament of Baptism for infants is normally offered on the last Sunday of the month, except during Lent, after 10 a.m. Mass. To schedule a baptism, please contact the Parish Office. A member of the team meets with couples bringing their first child to the Church for baptism. The monthly session involves brief faith sharing and explanation of the rituals. The Sacrament of Reconciliation is celebrated on Saturday at 4:00 p.m. - 4:45 p.m. and anytime by appointment. During Advent and Lent special parish penance services are held. Children are formally prepared for first reception of the Sacrament of Reconciliation during the second grade. This preparation includes parental involvement. Formal preparation for this sacrament is conducted in the second grade and is celebrated during the Easter season. Parental involvement, in addition to classroom activities, is essential for a child to receive this sacrament. Sacramental preparation is offered yearly to all eighth graders. The preparation offers the candidate, parents and the whole community a variety of ways to reflect and explore the faith. Through Christian witness and service with parents and fellow parishioners the candidate deepens his/her faith commitment. Couples wishing to celebrate their wedding at Ss. 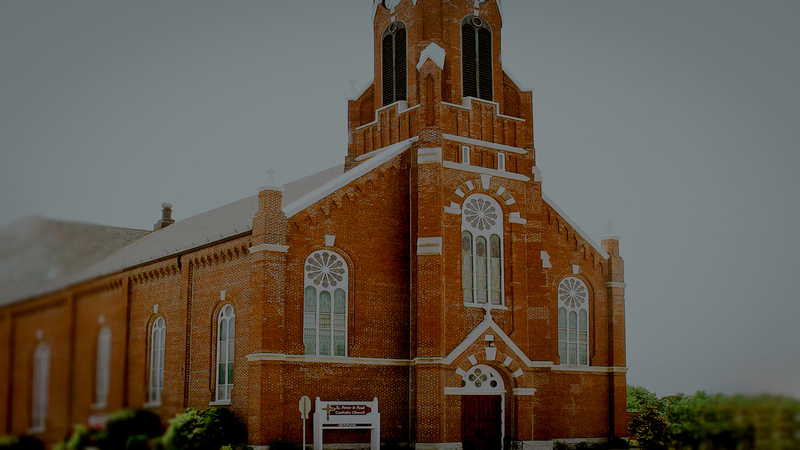 Peter and Paul Church are to contact the parish office at least four months prior to setting a wedding date and schedule an appointment with the pastoral staff. Marriage preparation consists of pre-marital counseling and a Pre-Cana program (a day-long or weekend retreat) to reflect on the issues that a Christian couple will encounter in their marriage. For more information, please contact the wedding coordinator listed within the Staff Directory. The anointing of someone who is frail because of age, approaching surgery or is seriously or chronically ill is encouraged. Contact the parish to receive this sacrament. This sacrament is communally celebrated once a year in autumn. The Sacrament is also celebrated at the local nursing homes.